This workshop is for anyone wanting to enhance their speaking skills, whether to speak-up at staff meetings, pitch an idea to clients, give a speech at a family celebration or even present at a job interview. In our personal and professional lives, the ability to deliver a message is an important skill. In this workshop you will learn the techniques that experienced speakers use to plan and deliver talks and speeches. You will also have an opportunity to view, discuss and practice what it means to deliver a meaningful message. Whatever your speaking goal, this course aims to help you feel more confident in your ability to orally present a message. If you’re a beginner, this course will help you master the fundamentals of speaking. 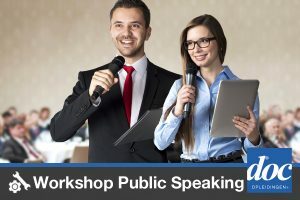 If you’re a seasoned speaker, this course will help you better understand public speaking and push you to the next level. This workshop consists of 6 very interactive sessions of 2.0 hours each. Upon completion of the course, participant will receive a certificate of participation.